Three high-reach booms hired from JMS, including an ultra boom with a 40-metre working height, have helped a construction company keep curtain wall installation on track at a high-profile housing project. The JMS customer was tasked with installing cladding during refurbishment work on a housing estate in Rainham, Essex, as part of a wider regeneration and new housing scheme. As scaffolding across the structure had been taken down, the cladding, cavity wall insulation, and roof insulation specialist turned to JMS to supply access platforms that would allow its operatives to work safely and productively at height. Three types of access boom were selected for the project. One was the JLG 1250 AJP, one of the largest booms available for hire in the UK. Another was the Haulotte HA20 RTJ Pro. Finally, two Skyjack SJ63 AJs were added to the mix. With all four machines operated in a coordinated way, the JMS customer’s teams could carry out all the refurbishment tasks safely, in a timely way, with the least disruption to residents, which was a key priority. Skyjack SJ63 AJ with tyre covers for added protection. The JLG 1250 AJP has a maximum working height of 40.1 metres and a maximum working reach of 22.86 metres. This meant operatives could work up to an equivalent height of a ten-storey building. The excellent outreach allowed the boom to be operated above large obstacles, making work sites quicker to set up with least disruption to other contractors and residents. Four-wheel drive and oscillating axles provide excellent mobility on site. 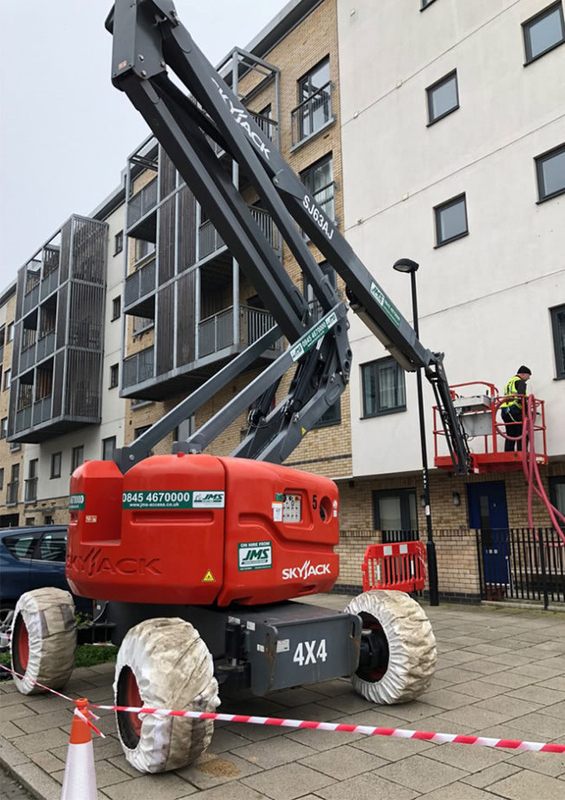 The Skyjack SJ63 AJ has a working height of 21.38m, an out-reach of 12.2 m, and an up-and-over clearance of 8.4 metres. Its 360-degree turret rotation and zero tail swing meant it could be operated more easily in confined spaces on site. The Haulotte HA20 RTJ Pro has a maximum working height of 20.6 metres, yet has a stowed width of just 2.42 metres, allowing it to be moved tight spaces. A good platform capacity of 230kg allowed operatives to take plenty of tools and materials to work for long periods at height. Like the other two aerial booms, it also performs well across rough terrain. 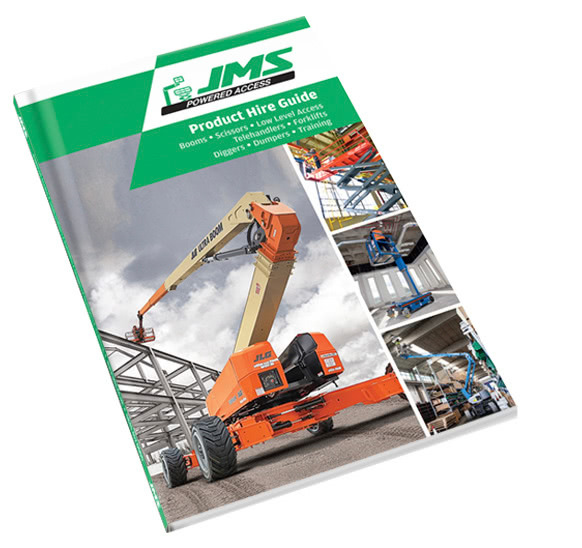 JMS has a large fleet of access booms from leading brands such as JLG, Skyjack, Haulotte, Niftylift, and Genie, with the aim of creating a one-stop-shop for all powered access needed.